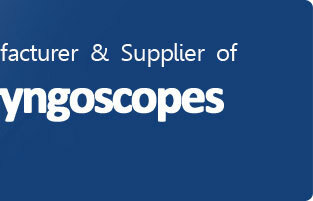 Disposable Fibre-Optic Laryngoscope Blades offered are of disposable variety and are made available in different finish options so as to suit particular application demands. Among the available choices include American profile Macintosh blades featuring smooth as well as gentle curve and can be made available in different size options for use with newborns, infants, children as well as with adults. 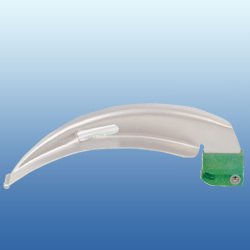 Further, the English Profile offered feature smooth, gentle curves extending from base of tips with provision of flange at left to push Macintosh laryngoscope blades out of way. Other than this, the range also includes Disposable Miller Blades with a straight tongue and slight upward curve near tip area. 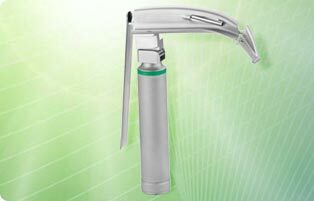 The options made available under this category include Disposable Fibre-optic Macintosh Laryngoscope Blade and Disposable Fibre-optic Green System Miller Laryngoscope Blade. 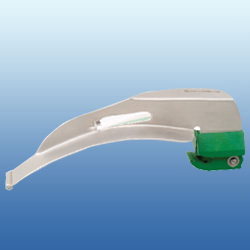 Disposable Fibre-optic Green System Miller Laryngoscope Blades offered comprise blades featuring straight tongue with slight upward curve near tip area. 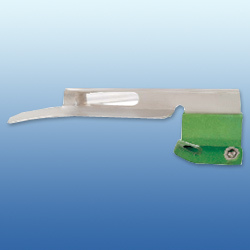 Being of disposable blade variety, these miller blades also feature flange web with tongue forming C with flattened top flattened at cross section area. Being of popular straight blade varieties, these come constructed in surgical grade stainless steel finish so as to provide for safe and secure usage. 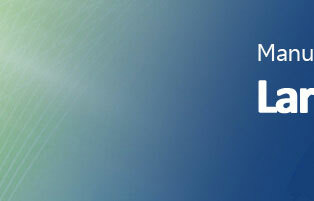 The durable construction quality of the blades as per the standards followed internationally also make these highly demanded in the market.